Winter is upon us and, as the nights close in, the opportunities to watch motorsport are DWinDLING. 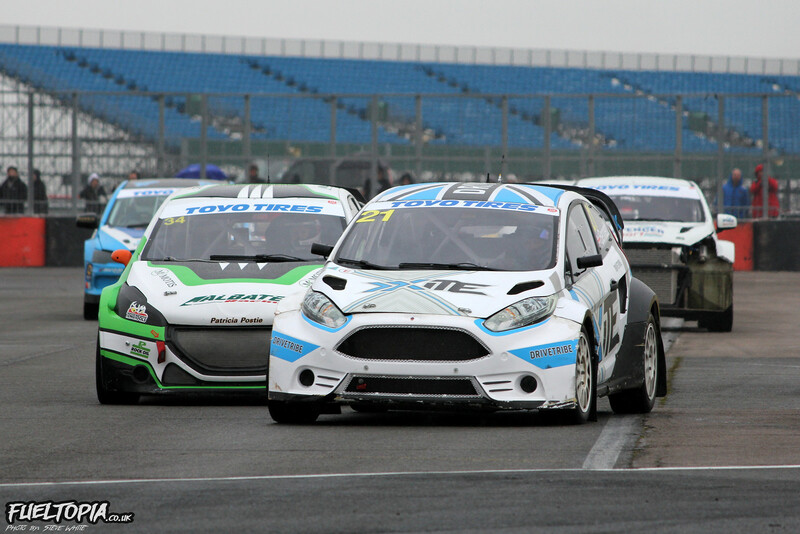 Thankfully the British Rallycross Championship is one of the last national series to wrap up this year WITH IT’s CONCLUDING round taking place at Silverstone. While several of the class titles had either been won or were all but decided prior to the final round, the Supercar category was still wide open with three protagonists all vying for the 2018 Championship. 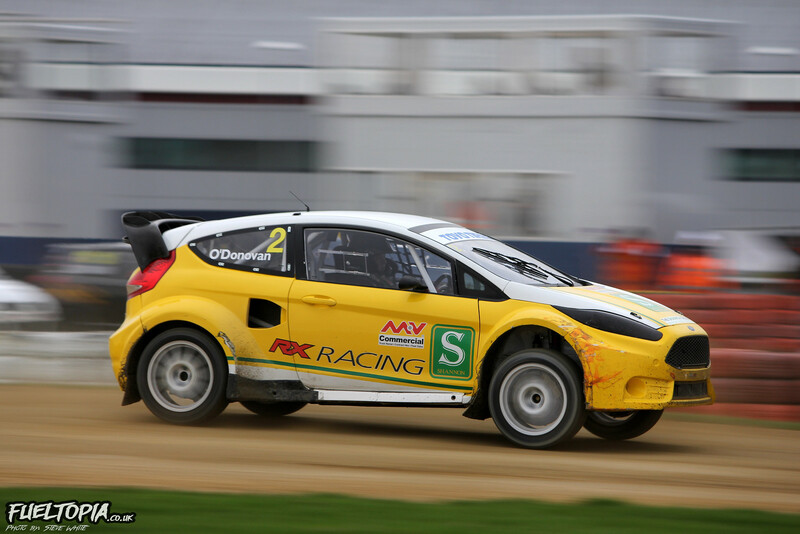 Leading the standings was 2007 British Rallycross Champion Ollie O’Donovan. Trailing Ollie by just four points came four-time title winner Julian Godfrey, with Mark Higgins sitting in third just a single point behind Godfrey. In the decade or so that I have been following the British Championship, this is easily the tightest Supercar title fight I can recall and I was hoping to see some close racing at the deciding round. If one of the leading trio took the win then the calculations were relatively simple; first or second for O’Donovan would see him secure the title, while both Higgins and Godfrey needed to win with O’Donovan finishing third or lower for them to take the Championship. Of course the calculations became a lot more complex if one of those three failed to win the round and, although Mark Higgins won the first qualifying heat, that began to look like a distinct possibility as both heats two and three were claimed by a hard charging Oliver Bennett. 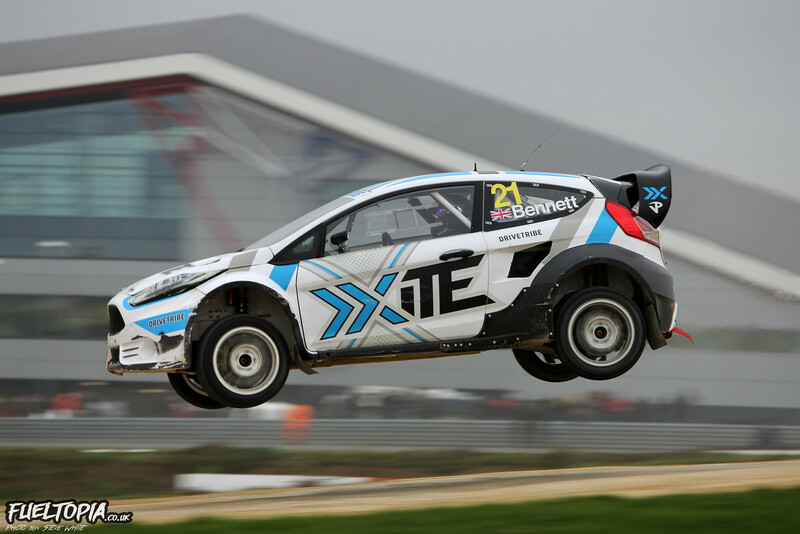 After making his first foray into the Supercar class last year, Oliver Bennett has massively stepped up his commitment to rallycross this year with a World Championship campaign in a freshly built BMW MINI and a handful of other outings in his ex-OMSE Ford Fiesta. Although I have questioned his approach, I certainly can’t critique the enthusiasm that Bennett seems to have for the sport. That appeared to pay off at Silverstone, as his drive was easily the best – and most committed – I have seen from Oliver in the last two years. 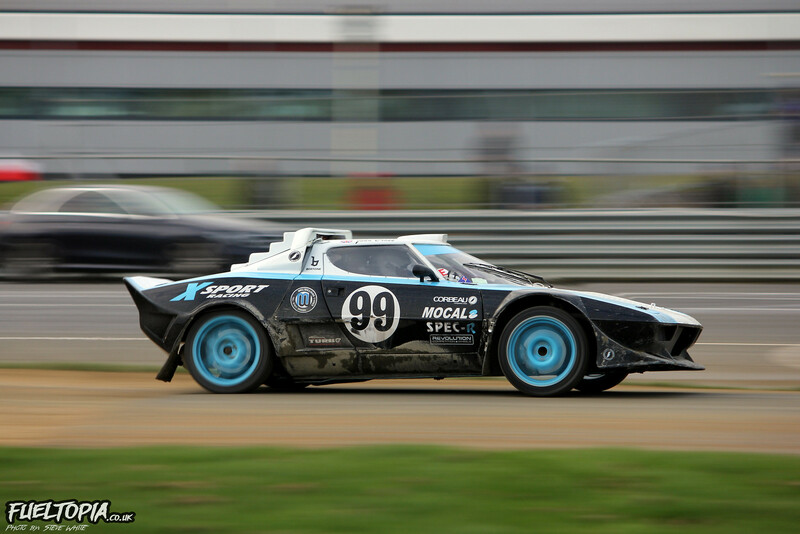 There have been several well documented builds for the Retro Rallycross Championship but, aside from a few rumours, I had seen little of the “new” Lancia Stratos of John Cross until it rolled out of the paddock and onto the track. Originally used for rallying, this car has been heavily reworked and now utilizes modern WRC derived suspension, a turbocharged VR6 engine – developing a very healthy 475 BHP/510 Ft. Lbs – and a plethora of shiny Spec R goodies in the engine bay. Silverstone marked the competition debut of the car and, although John wasn’t able to challenge the leaders, fifth was a very respectable result for the car on its first outing. With the off-season to refine the setup of the Stratos I’m expecting this to be a frontrunner in 2019. Steve Harris was the early pace setter in the Retro category. 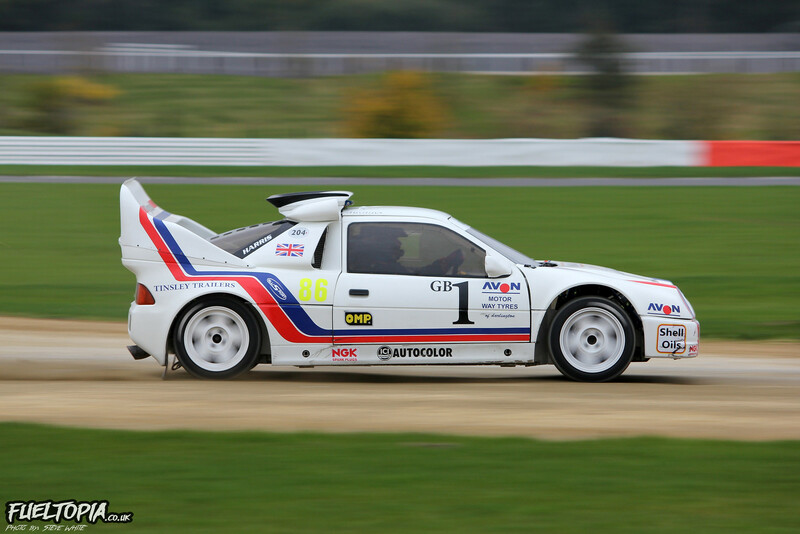 After watching Harris win Retro races at both Lydden Hill and Loheac earlier in the year I was hoping that his RS200 would deliver the goods again at Silverstone. Unfortunately the day came to an early end for Harris as his car broke a driveshaft in heat three and, with no spares available, Steve was forced to retire. 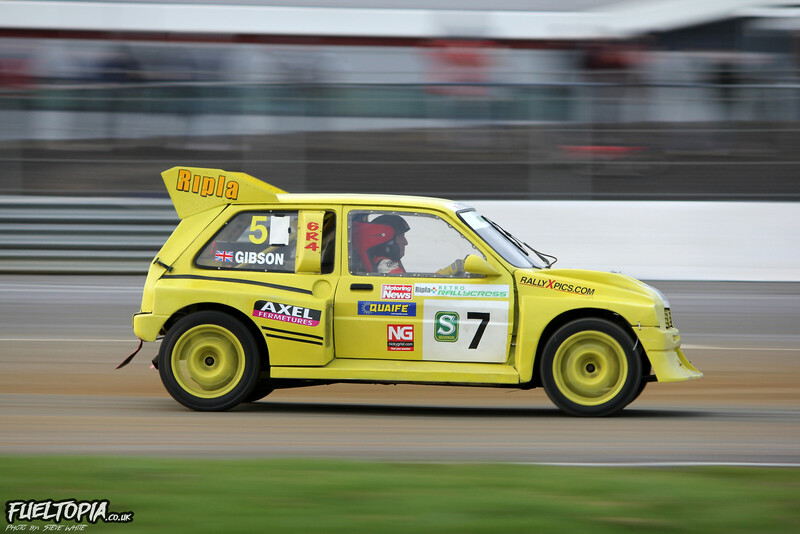 It was a real shame not to see the Ford finish the day – especially as it looked likely Rob Gibson was going to give Steve a run for his money – but hopefully the RS200 will be back in action again next year. 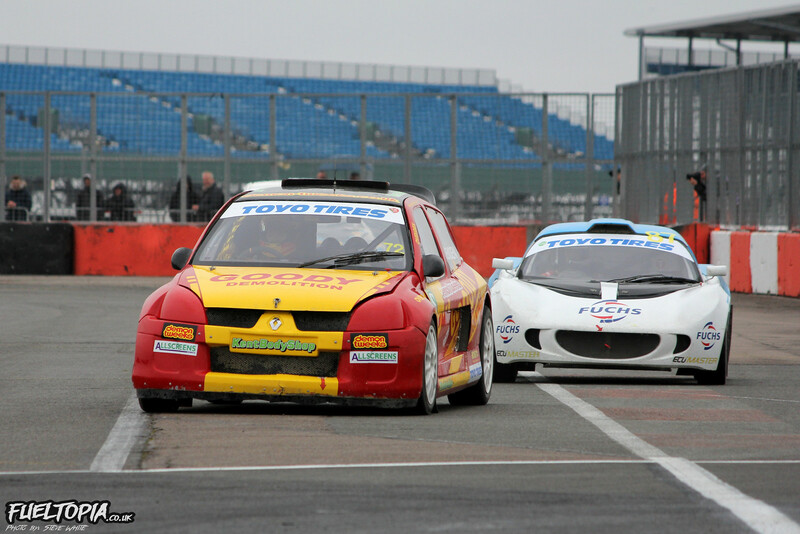 With the four-wheel drive Retro title won at Croft, the two-wheel drive titles were the main focus at Silverstone. James Harold was in line for the Super Retro class (for 2WD cars over 1600cc) crown and John Button Memorial Trophy (for all 2WD cars) if he could hold off class rival Gary Dixon and Retro class (for 2WD cars under 1600cc) Champion Ian Biagi. As the remaining four-wheel drive entrant it was no surprise to see Rob Gibson rocket away from the line at the start of the Retro final. 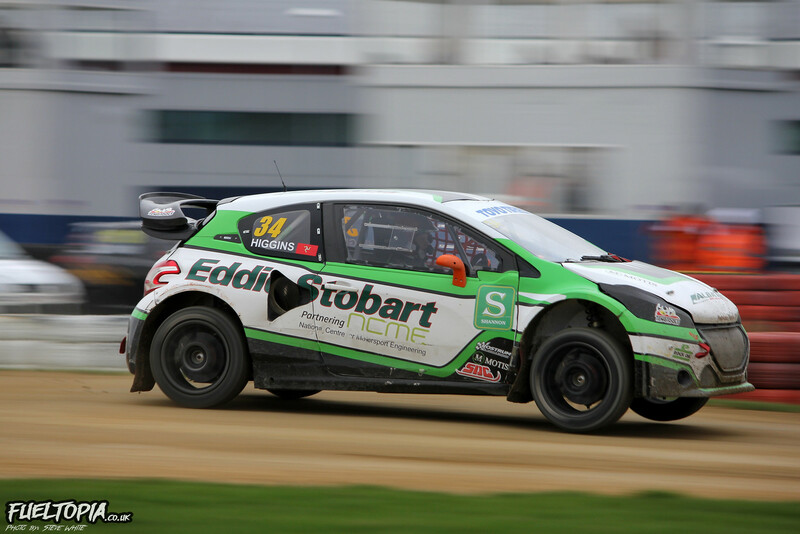 Threading his way through the two-wheel drive competitors, Gibson took an early lead which he wouldn’t relinquish for the rest of the race. Behind Gibson it was Super Retro drivers Ray Morgan and James Harrold who fought for top spot, with Harrold eventually finishing second to Morgan. That was enough to not only win James the Super Retro title, but also scoop the John Button Memorial Trophy as well. 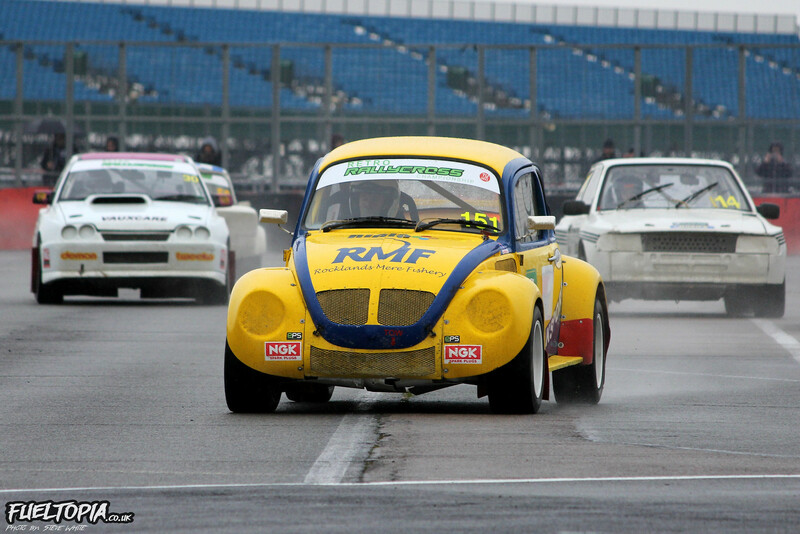 The PPJ Beetle is a hugely iconic car in rallycross history and it’s fantastic to see it still collecting trophies. 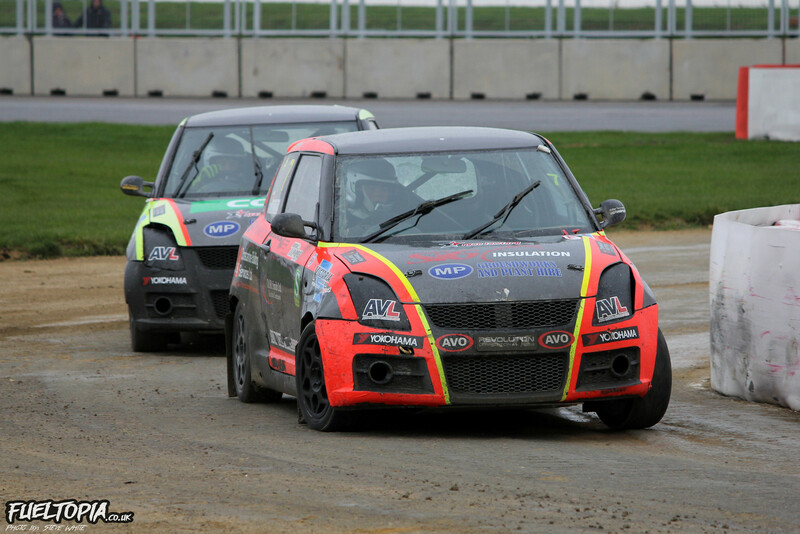 Another of the titles to be decided at Silverstone was the Junior Swift Championship. As I stated in my review of round seven of the Championship from Lydden, the Junior category has provided close racing throughout the season, the resultant of which were the two leading drivers – brothers Luke and Tom Constantine – arriving at the final round with just a single point between them. 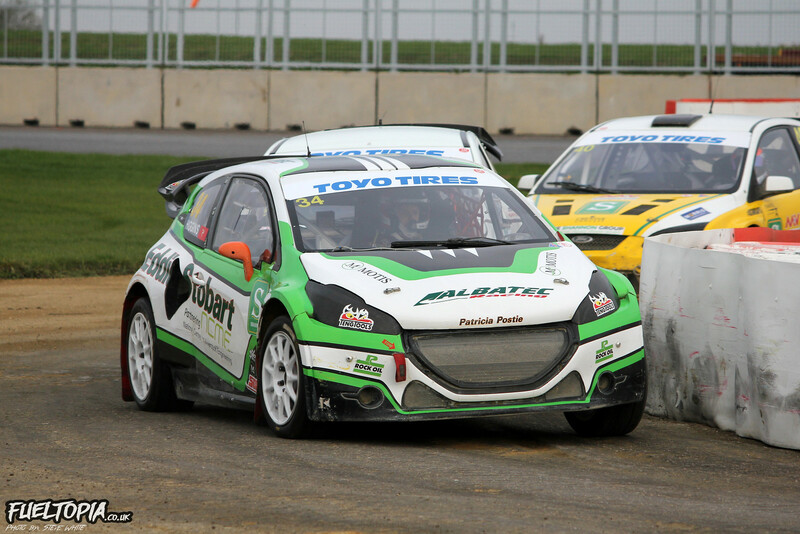 The Constantine pair took the fight all the way to the last lap, with Tom eventually winning the final and, with it, the 2018 Junior Championship. Further down the field, Marius Solberg-Hansen and Kristiane Hvaal Engh had an excellent scrap for fourth, a duel which Hvaal Engh eventually won. I am certain the driver roster will change again for 2019, but I hope that the Junior Championship continues to deliver next year as, in my opinion, the class has been the most consistent for providing close racing in 2018. 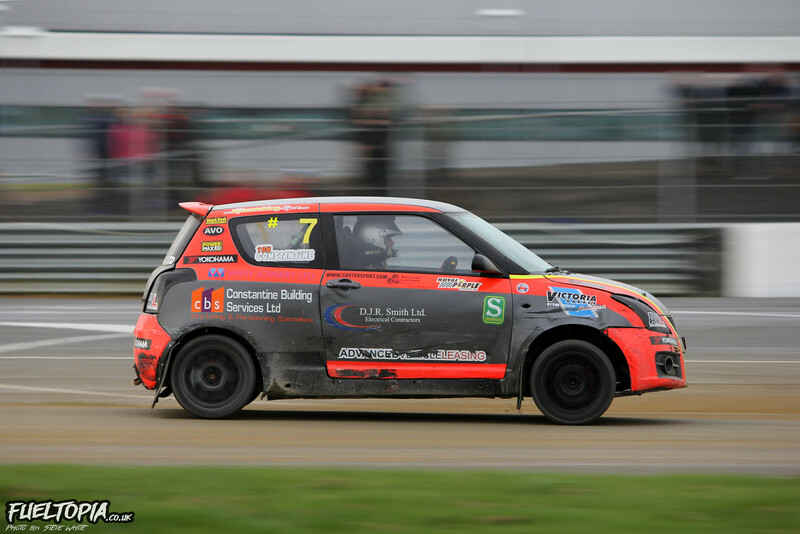 Having already secured the Suzuki Swift title, newly crowned Champion Morgan Bailey elected to sit out the final round of the season. 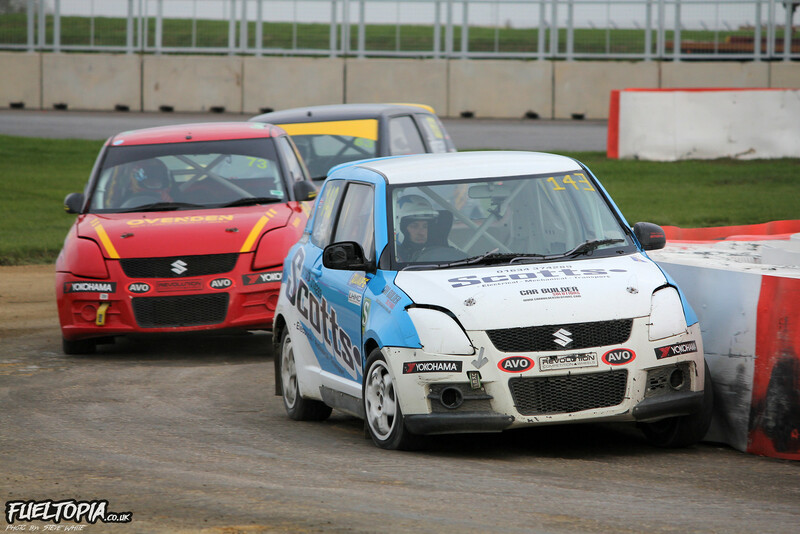 Outgoing Swift Champion Simon Ovenden looked the strongest competitor in the heats, with second in the opening qualifier followed by first place finishes in heats two and three. However, despite Simon starting the final from pole position, it was Christopher Scott who led the pack at the end of the first lap. 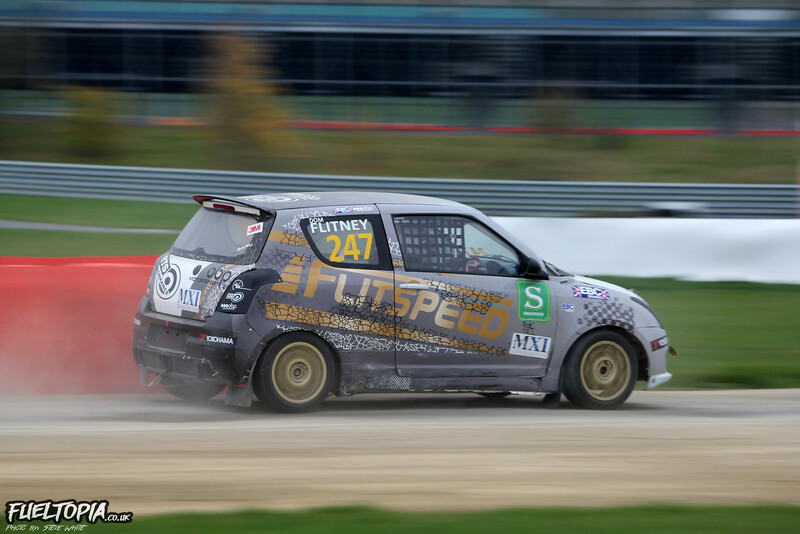 Although he wasn’t able to challenge for the win Dominic Flitney recorded his best result of the season with second place. Tom Llewellin made smart use of the joker in order to take the lead and top qualifier Simon Ovenden slotted into third, relegating early leader Christopher Scott to fourth. Max Weatherley recovered from an impromptu stunt show during the final to finish sixth. Perhaps leave the two-wheel stuff to Terry Grant next time Max? 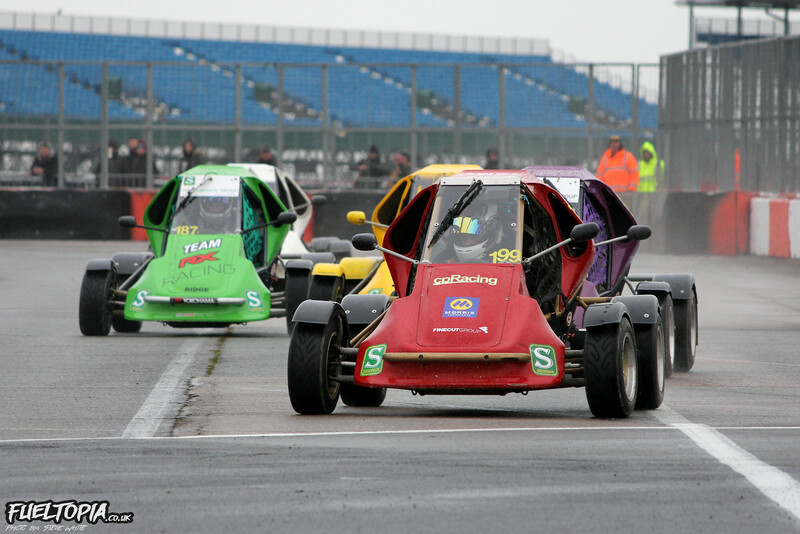 Tristan Ovenden had all but taken the Super National Championship and, with his closest rival Paige Bellerby not competing at the final round, Tristan just had to line up for the final at Silverstone in order to claim the title. Although Paige wasn’t racing, her Lotus Exige was still out on track in the hands of her father (and rallycross veteran) Dave Bellerby. Paige has looked a lot more competitive in the Exige this year but, as an old hand, I was excited to see what Dave could do behind the wheel of the Lotus. Dave didn’t disappoint and he was the only driver to beat Tristan Ovenden during qualification, winning heat three and placing second in heats one and two. Mixed fortunes for all the Super 1600 drivers had resulted in an unpredictable season finish for the class, with four drivers all in contention for the title. I had seen the announcement from 2014 Super 1600 Champion Jack Thorne referencing two cars, however I didn’t appreciate the significance of his news; I assumed that the two cars in question were Thorne’s original Super 1600 Citroen C2 and his ex-Set Promotion Renault Twingo, but it was only when Jack hit the track that I realized he has now acquired another Set Promotion Twingo. 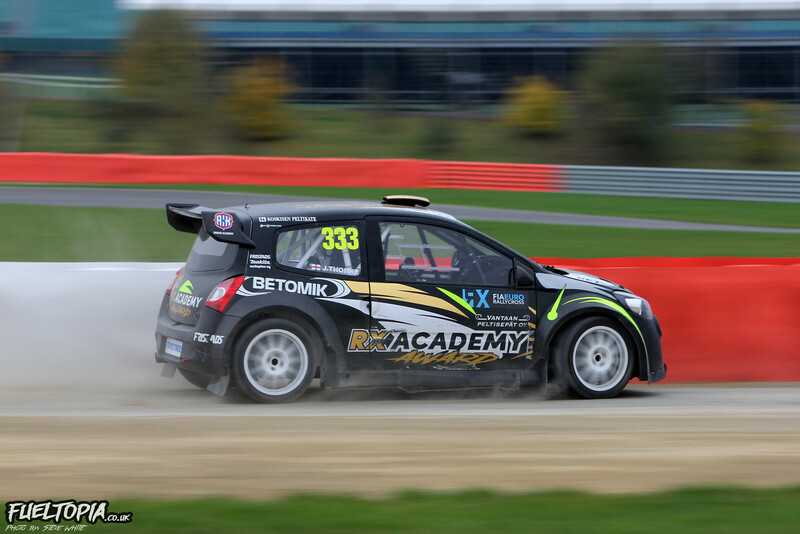 This car is such a recent addition to the Thorne stable that Jack raced the Renault at Silverstone still sporting the RX Academy livery of it’s previous occupant, Jesse Kallio. Once again mixed in with the Super National class, Jack Thorne was the quickest Super 1600 driver throughout the heats and only beaten by the fastest of the Super National drivers. Fellow Super 1600 driver Paul Coney looked close to Thorne in the opening race, but the divide between Thorne and Coney seemed to increase throughout the day. Darren Scott began his day with a roll during the practise session, meaning he had to miss the opening heat race and Craig Lomax was unable to run in any of the qualification races. 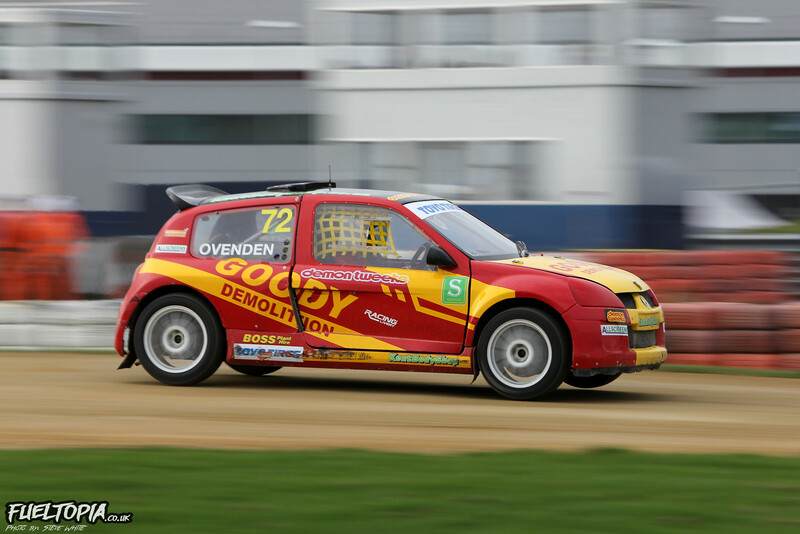 Paul Coney was the only Super 1600 driver who looked capable of challenging Jack Thorne in the final, but Thorne was blisteringly quick in the mixed weather conditions during the afternoon and even managed to put the Clio V6 of Tristan Ovenden in his rear-view mirror during the final. 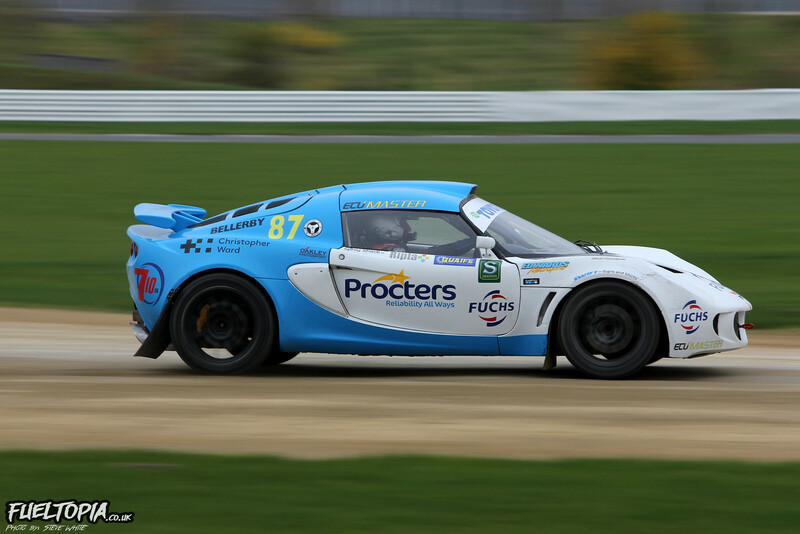 The only car ahead of Jack was the Lotus Exige of Dave Bellerby, which was superbly driven to overall victory in the combined Super National and Super 1600 class. Second for Jack gave him maximum class points and netted him the 2018 Super 1600 title, while third for Tristan Ovenden cemented his second Super National Championship. 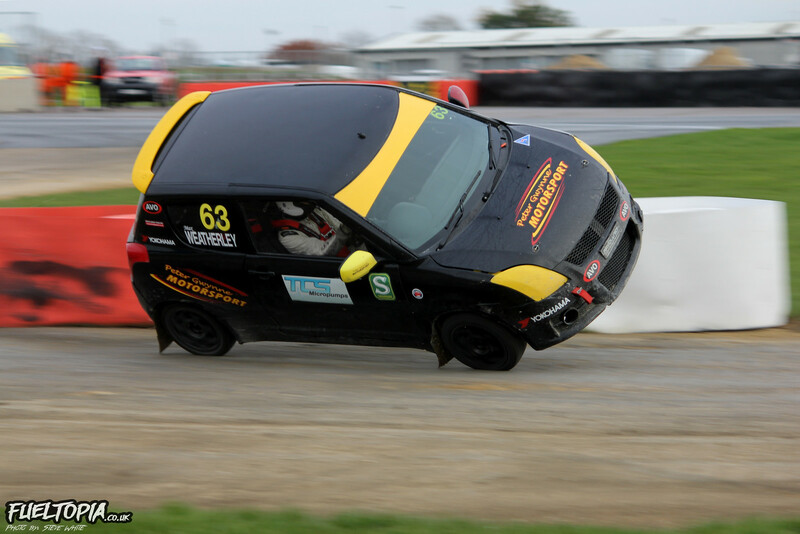 Ovenden has driven fantastically again this year, but Bellerby (senior) proved that the Clio V6 certainly isn’t unbeatable. 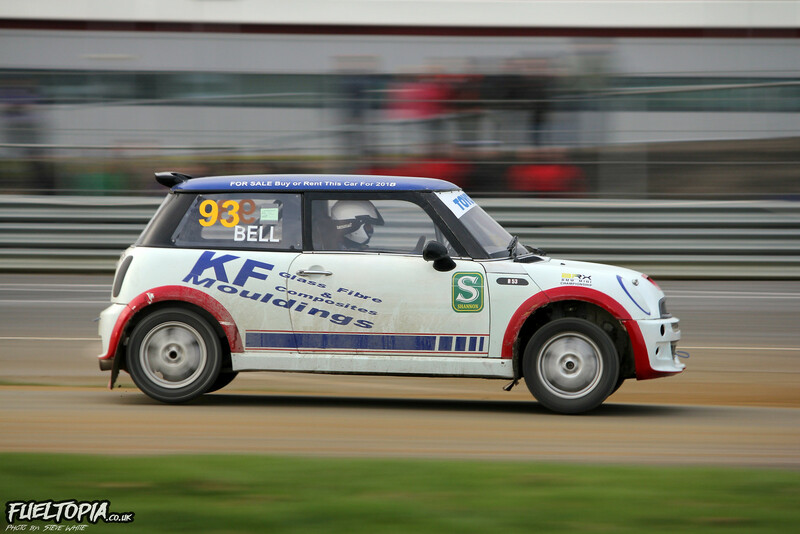 David Bell and Martin Hawkes were the favourites for the BMW MINI title, with Bell holding the advantage prior to action getting underway at Silverstone. A clean day of racing to see David through to the final was all that was needed, but that was exactly what he didn’t get. While his closest rival Hawkes posted top four times in all three heats, fourth quickest in heat two was the best Bell could manage. Starting the final from the second row of the grid David was unable to challenge for the lead, however he recovered from his woes in the heats to climb up to third which, despite Hawkes taking the win, was enough for Bell to win the Championship. As with the Junior Swifts I have been impressed with the closeness of the MINI racing this year and, with an increased entry vaunted for 2019, I will be paying close attention to this class next year. 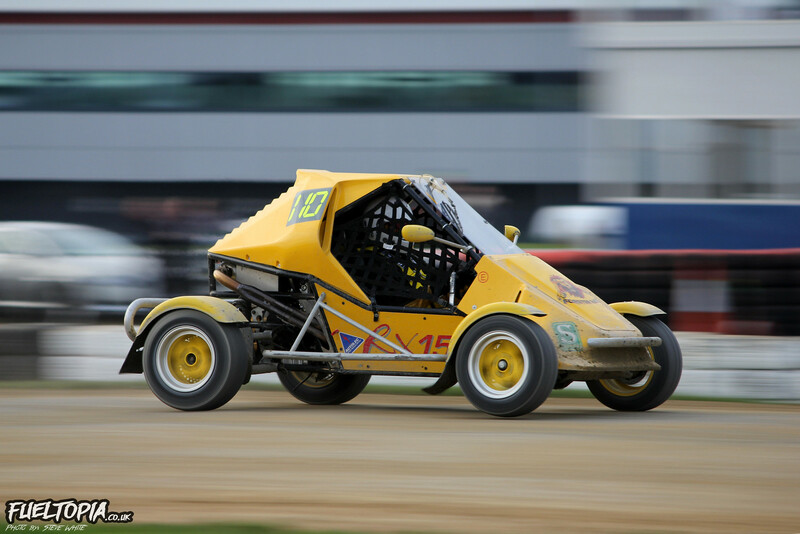 Entry numbers in the RX150 buggies have wildly fluctuated this season, but with seven drivers participating at Silverstone there were enough drivers to at least guarantee some racing in the mid-pack. I say “mid-pack” as, thus far, no one has looked on par with Chrissy Palmer. In the qualifying heats reigning Champion Palmer was as unassailable as ever, with the rest of the field following in his wake. There was at least some challenge for Palmer in the final, as Leo Forster snatched an early lead which Chrissy had to fight to take back. 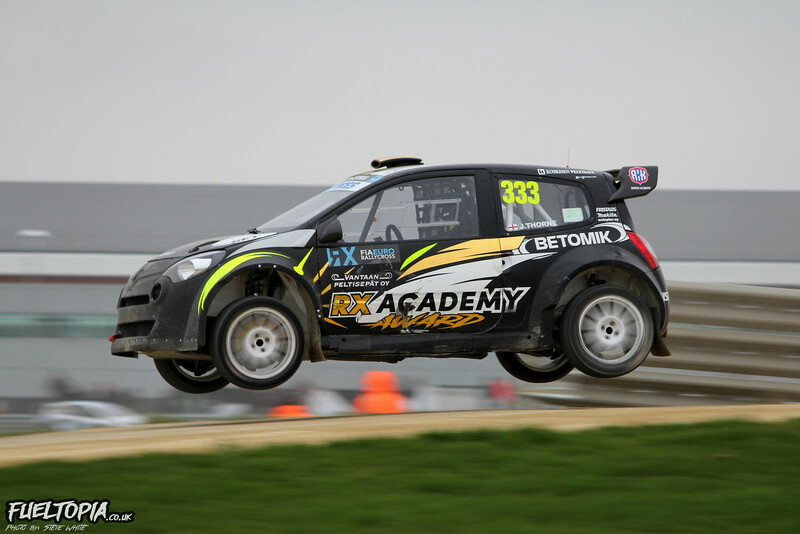 Jami Kalliomaki, who last raced at Silverstone in an RX Lite back in May and was a guest driver in the RX150 class, completed the podium. 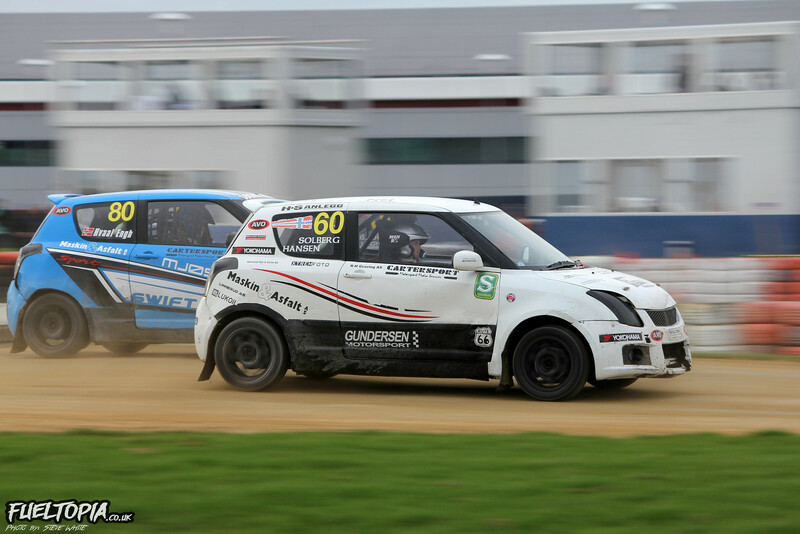 Of all the classes currently incorporated in the British Rallycross Championship the RX150 is the one I think has really underperformed this year. Unless entry numbers can be significantly increased next season (and Chrissy Palmer slows down!) I would question the merit of the category returning again. 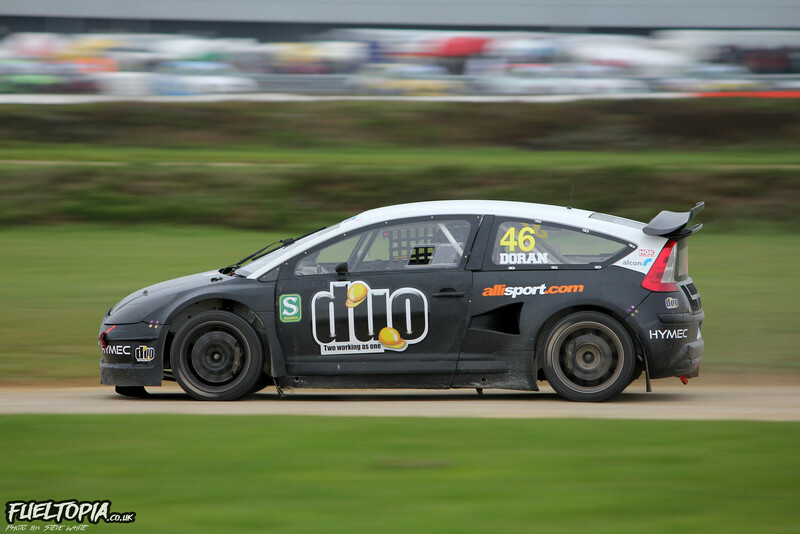 After missing most of the 2018 season due to injury, rallycross stalwart Pat Doran was back in action at Silverstone behind the wheel of a LD Motorsport Citroen C4. Pat hasn’t looked like a title challenger the last few years, but he is still competitive and it’s always great to see him in action. Doran had a slow start in the opening heat, but his form improved throughout the day and he was third fast in the last heat race. Unfortunately Oliver Bennetts fantastic run came to end in the first Supercar semi-final. 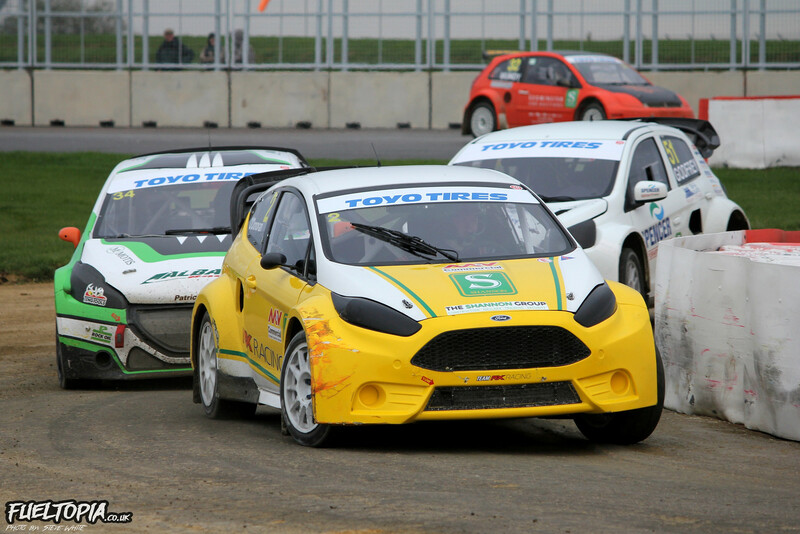 After winning two of the three qualifying heats, Oliver started the semi from the pole position spot. 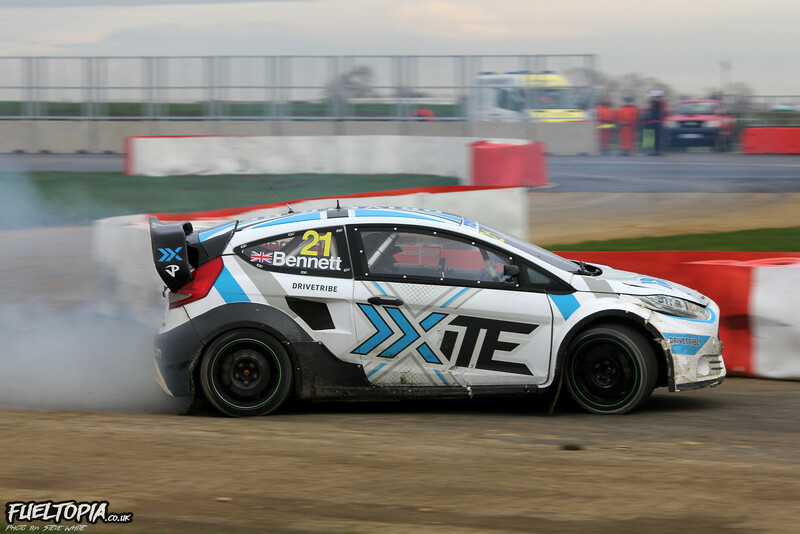 After tangling with another car, Bennett continued to race while an ever-increasing cloud of smoke trailed from the rear left corner of the Fiesta. On lap five that smoke turned to flames and Oliver pulled off onto the outside of turn eight, where his crew managed to extinguish the fire before it enveloped the entire car. It was a real shame to see Bennett exit proceedings as I am certain he had the pace for a podium finish. With Oliver out of the running the lead of the semi-final fell into the hands of Dan Rooke. 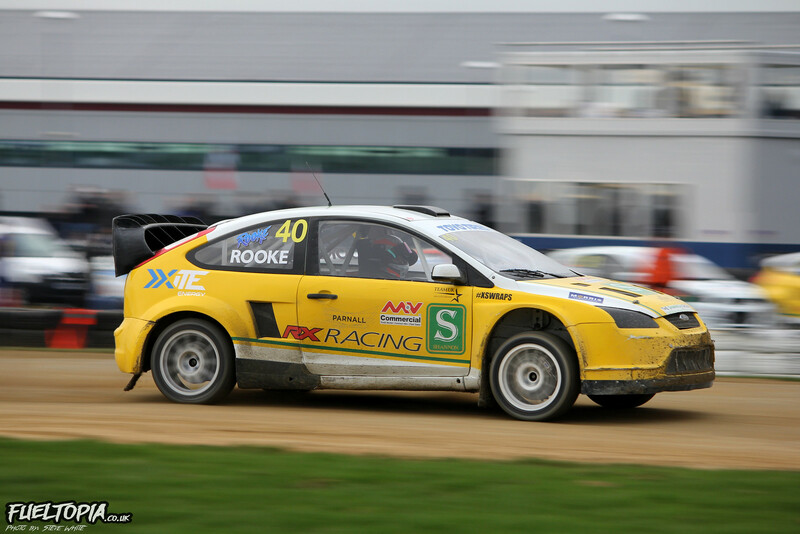 Rooke was making a one off appearance in the “spare” Ford Focus Supercar of Ollie O’Donovan, which Ollie had been kind enough to offer Rooke for the final round (though a cynical man might say O’Donovan was deploying Dan in order to make life more difficult for his Championship rivals). Still, irrespective of the reason, it was brilliant to see Rooke behind the wheel of a Supercar again. 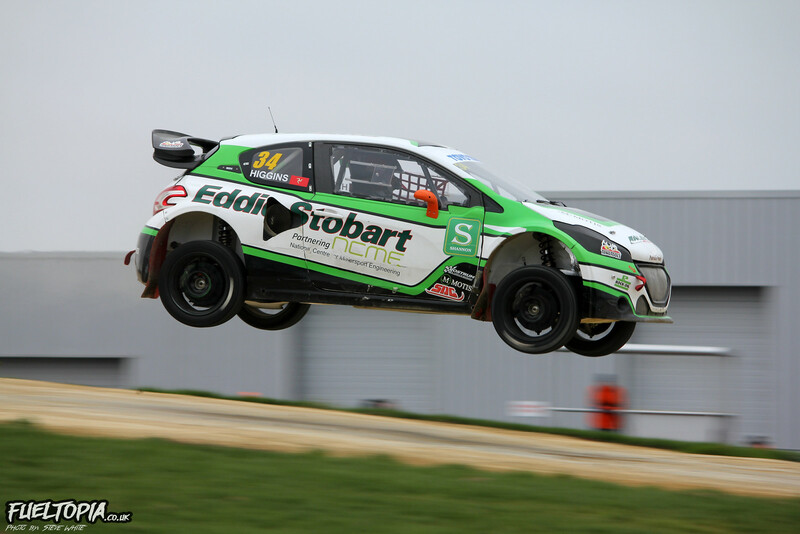 Despite a year out of regular competition, Dan managed to extend a six second lead over Pat Doran, with Mike and Liam Manning finishing the first semi-final third and fourth respectively. You could be mistaken for thinking the starting grid of the second Supercar semi-final was the final, as all three title contenders lined up together on the front row. Ollie O’Donovan led the field on the first lap, but an early joker coupled with several rapid laps saw Mark Higgins take first when O’Donovan opted for his joker on lap four. Julian Godfrey, who had elected to take the joker on the opening lap, managed to steal second from O’Donovan. With Ollie finishing the second semi-final in third he had at least secured himself a place in the final, but he would be starting from the second row of the grid and the chances of him securing his second British title were beginning to slip away. 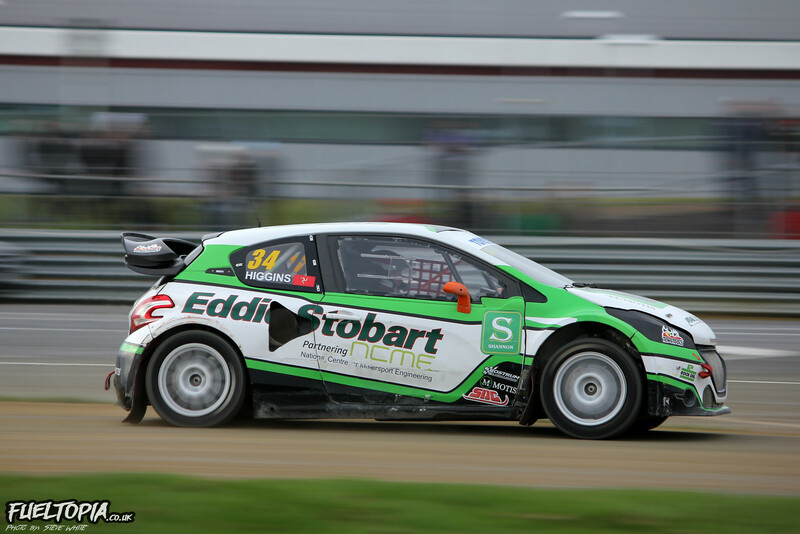 Behind the three Championship contenders Steve Hill put in another solid performance. Although he hasn’t headed the field this year, the Evo X of Hill has looked a lot more reliable and fourth in the second semi-final saw Steve secure the last slot in the final. With Dan Rooke taking the victory in the first Supercar semi-final, it was Rooke who would line up alongside semi-final two winner Mark Higgins on the front row. When the lights went green for the Supercar final pole-sitter Higgins held the inside line – and his nerve – into turn one to take the lead. While Mark attempted to get away, the rest of the field devolved into a series of small, unpredictable, battles as drivers attempted to use the joker to try and gain an advantage. Dan Rooke ended up scrapping with Steve Hill while Ollie O’Donovan found himself staring (and occasionally nudging) the back bumper of Pat Doran. After mixed results in the heats, the last day of the Championship really hadn’t gone the way of Ollie O’Donovan. 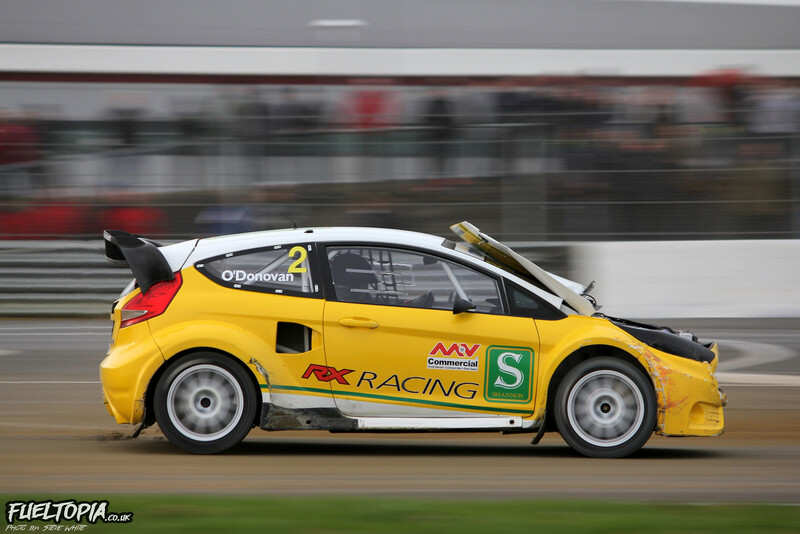 Having arrived at Silverstone in the strongest position of the three title challengers, O’Donovan looked on the back foot in the final and it showed in his driving, which became increasingly more aggressive throughout the race. Given that Ollie and Pat Doran have been racing together for many years I did wonder if Doran might let O’Donovan slip by in order to take the all-important third position and deny Mark Higgins the title, but Pat gave no quarter and the chances of Ollie finding a way around Doran to take the vital spot shrunk even further when the bonnet of the RX Racing Fiesta popped up in the closing stages of the race. 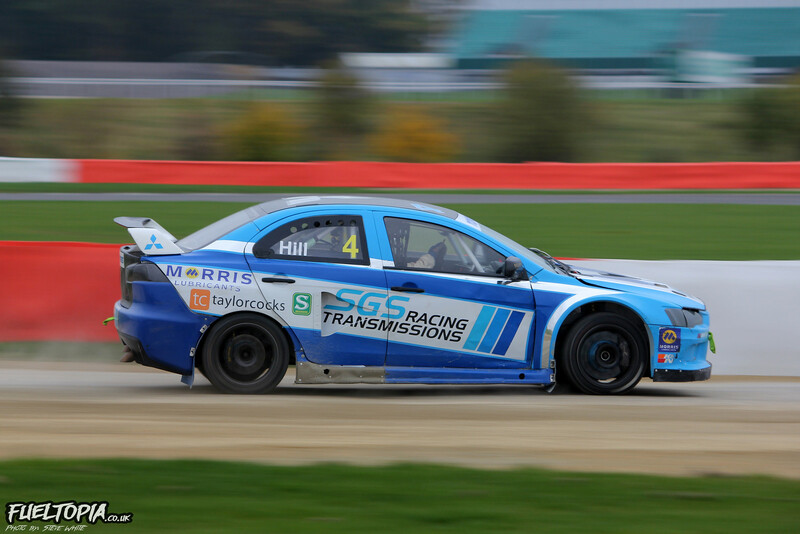 While the rest of the field fought for positions Higgins was free to put in a series of blistering laps and, despite the best efforts of Julian Godfrey, Mark manage to stretch out a six second lead before taking the chequered flag. Godfrey finished second and Pat Doran, who resisted repeated assaults from O’Donovan (even after his bonnet popped up! ), took the third step of the podium. When the dust had settled and the points were tallied it was revealed that Higgins had won the title by just two points. I typically tend to support the established drivers rather than the newcomers, but Mark is a huge talent and I think he is a deserving Champion. Second for Godfrey resulted in him equalling the Championship point tally of Ollie O’Donovan, but the vice-Champion title was awarded to O’Donovan on countback. Although I am still not overly enamoured with Silverstone, the circuit wasn’t detrimental to the Championship fight which was every bit as close as I had hoped. A top three separated by just two points at seasons end: how many other Championships can claim that narrow a finish this year? The biggest shame of the day – and something that Jimmy has already touched on in his blog – is that so few people were around to see the racing and, with Motorsport.tv no longer broadcasting, I suspect the TV program is unlikely to reach a very wide audience either. Although it has it’s minor flaws, I think the British Championship is a solid one: but more people need to know that!